It's the first week back for staff at the Togiak National Wildlife Refuge after the partial federal government shutdown ended Friday night. The three-week stopgap funding measure expires on Feb. 15, and staff have to do some juggling. 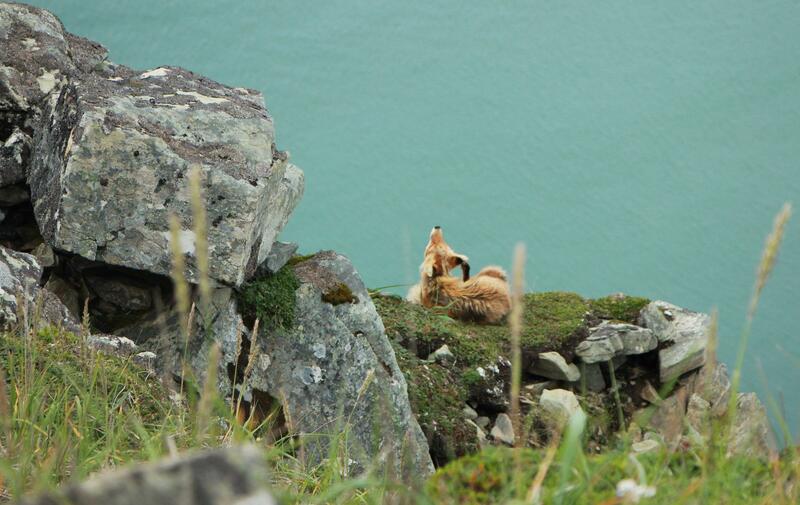 A fox on a cliff at Cape Peirce, in the southwest of the Togiak National Wildlife Refuge. The Togiak National Wildlife Refuge remained open during the 35-day shutdown, but almost all the staff were on furlough. Only two employees were still working, the refuge manager and the federal wildlife officer. They, along with the furloughed staff, missed two paychecks. “The first priority is to take care of our employees and make sure they’re whole, make sure that their pay and benefits are correct and resolve any problems that have resulted from the shutdown. That’s the first thing on our books,” said Refuge Manager Susanna Henry. The refuge will also pay its overdue bills to Bristol Alliance Fuels and Nushagak Cooperative; during the shutdown, those companies continued to provide fuel and electricity to the refuge without immediate reimbursement. The shutdown took effect for the refuge on Dec. 26. In the weeks that followed, Henry and her colleague maintained refuge buildings and housing. In the winter, this is no small task. "The heating bills are the highest of all, and it tends to be the time that we see heat-related, and winter-related, emergencies," Henry said. "We had a number of those that we had to handle with few staff on hand. We had to lean hard on contractors locally to get some things resolved." According to Henry, staff usually plan for the rest of the year in January. Now, they have to do some juggling. The refuge surveys communities annually to find out how many waterfowl were harvested in the past year. Usually, that survey takes place in January, but this year it will be pushed back. Also, annual wildlife studies of caribou, moose and wolves are scheduled for March, and staff will need to plan for those more quickly than normal. “When I think about January in Alaska, what it really does is puts us behind on our planning and preparation for things," Henry explained. "I think it’s to be determined what things are going to be cancelled outright and what things can we postpone and still accomplish." The three-week stopgap funding measure passed by Congress expires on Feb. 15. The uncertainty that accompanies the short-term solution puts staff in a time crunch. In addition to completing work that they had planned for January, Henry said her staff are trying to make sure the refuge will be in good shape if the shutdown resumes. “Things that were already scheduled to take place in the next three weeks, I think people are scrambling to make sure that they do take place in the next three weeks," Henry explained. Through mid-February, the refuge will prioritize research, outreach and trainings that had been planned for January and keep an eye on negotiations in the capital.